BluePrint Gaming have been continuously challenging the online casino industry with innovating and unique creations, meant to bring players’ experience to the highest standards of entertainment. 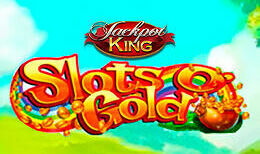 Their developers are committed to keeping the company in the lead and create an engaging slots experience for everyone. Slots’O Gold brings a bit of Irish magic to the equation and grants large pots of gold to anyone who embarks on this adventure and presses the Spin button. Follow the path to the end of the rainbow and find the promised Irish gold in this slot Jackpot casino game designed around the Irish folklore theme. Luck is on your side at every turn, as you stroll around a field of four-leafed clovers, accompanied by leprechauns and collecting horse shoes. There’s not much more that you might need in order to win big, so you can sit back and let luck take care of it. This slot game has 5 reels and 10 paylines filled with magic. Sit back and enjoy the majestic and fantastical view of an Irish forest, designed with the most beautiful colours to please your eyes. The reels are suggestively golden and there’re plenty of coins present to keep your motivation up. When spinning, cheerful Irish themed music starts playing, for an extra touch of fun. You can choose your bet starting from 0.20 and going up to 500.00 credits, depending on how lucky you feel. The symbols in Slots’O Gold are representative of Irish tradition: clovers, pints of Ale, a leprechaun’s hat, a pot of gold. Watch out for the last two, as spinning 5 of either will multiply you bet by 5x. The Leprechaun symbol is your Wild Card in this slot game and when you spin at least one, it substitutes any other symbol to form winning lines, by stretching across the whole reel. Moreover, it activates a second spin, called a Rainbow Respin. Another precious symbol is the Rainbow Gold one, as it changes into a random symbol whenever it lands on the reels uncovered, maximizing your wins by revealing new matches. If these magic creatures are on your side, nothing can come between you and your prizes. If you ever want to lie back and let the game do its job, you can, by pressing Autospin and selecting the number of spins, loss limit and win limit, and then you’ll have absolutely no worries and you can fully enjoy the beautiful graphics and atmosphere that Slots ’O Gold has to offer. This 5-reel slot game makes the most out of the Irish Folklore theme and brings magic to an otherwise regular experience, while also keeping the gameplay simple and appropriate for both rookies and returning players. You might just find your own pot of gold! Slots’O Gold promises a very entertaining slots experience, packed with luck symbols to help you all throughout and guide you towards big wins and prizes. Chances are you’ll find the concept and graphics very pleasing and want to come back and play more fun slot games here. To see all our available games you can visit our homepage.